Report by David Kjellberg and Gustav Gillberg. 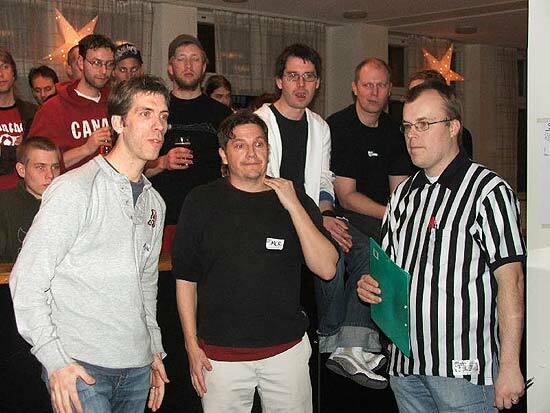 As the cold and dark winter approaches the Swedish pinball players always look forward to the national pinball championship, usually taking place in November. This year it was a bit unclear if there was going to be a championship, but fortunately people stepped up to make the event happen. Mikke Norlin and Purre Persson took on a great part of the work load. For instance, they supplied more than 20 games to the event! (to the right). In the middle Johanna who organised the side tournaments. Monster Bash, Dirty Harry, Judge Dredd, Attack From Mars, Indiana Jones, Demolition Man, No Good Gofers, White Water, Terminator 2, Bram Stokers Dracula, The Shadow, Congo, Road Show, Fish Tales, Scared Stiff, Twilight Zone, Theatre of Magic, The Addams Family, World Cup Soccer and Medieval Madness. Lord of the Rings, Tales of the Arabian Nights, Popeye, Maverick, Whirlwind, Theatre of Magic, Attack From Mars, Funhouse and Last Action Hero. as tournament official during qualification. The main competition had 170 participants from all over Sweden. Many of those players also participated in the side events that took place during the weekend. The doubles tournament, played as a double elimination playoff, was won by Per APB Holknekt and Christian MAG Magnusson. The one-hand competition was played on Attack From Mars and the winner Johan JG Genberg scored 1.9B. In the Dragster competition you were supposed to reach the score of one million points on Tales of Arabian Nights as fast as possible (the replay award was fixed at this score level to help decide when the score was reached). Helena YOO Walter won this competition with the time of 44 seconds. There were also two “Set the High Score” games, Attack From Mars and Popeye, set to no extra balls and tournament mode. Per APB Holknekt got 20B on the Attack From Mars (this machine was pretty tough to play) and Karl KGB Broström got 3B on Popeye. A fairly new discipline is the team competition “Rumpa” which is a fun and social way of playing pinball. 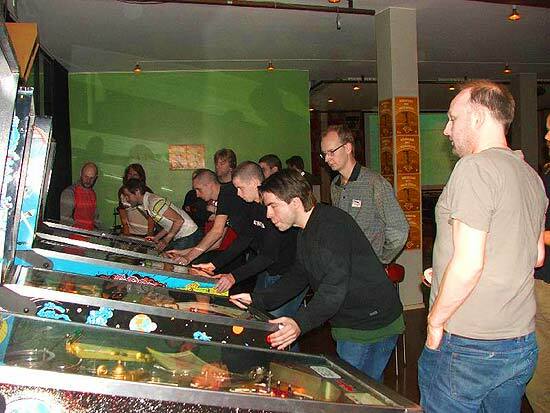 There are some different versions of the rules of “Rumpa” but this is how it was played this time: A team consists of four players and the pinball machine is placed in the middle of the room with open space all around. The first player of the team starts the ball and tries to make a shot. As soon as a shoot is made (a loop, a ramp or a hole) you have to switch to the next player in the team and the one who has played has to run around the pinball machine to line up behind his/her team mates. 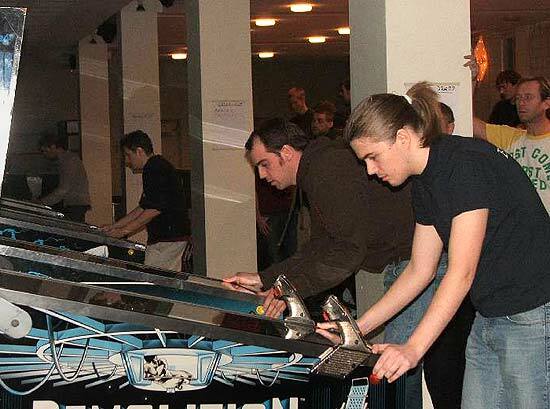 During multiball you have to play split flipper. If a player drains he or she is out, which means that on ball two there are only three players playing for the team and on ball three there are only two players, making the game play very intense towards the end! The team scoring the highest wins. The winning “Rumpa” team was “Team Stjärtgossarna”, consisting of Linus S P Jorenbo, Jorian JOE Engelbrektson, Jörgen IFK Holm and Fredrik REY Malmqvist. The main competition qualification round took place during Friday and Saturday, and the playoffs on Sunday. In the qualification the player gets two attempts on each of four randomly selected titles. Your scores are ranked for each title and qualification points are distributed depending on your rank. This year we saw some impressive scores on Demolition Man (6.1B by Stefan FEZ Andersson), Road show (3.2B by Jörgen IFK Holm) and Scared Stiff (55M by Victor TFF Håkansson). All games in the competition were set to tournament mode with all extra balls turned off. The winner of the qualification round was Reidar LEL Spetz who got consistent and competitive scores (14.4B on Attack From Mars, 50M on Medieval Madness, 143M on Terminator 2 and 2.5B on Theatre of Magic). The 24 players with the best qualification score were directly qualified for the playoffs. Those in places 25 to 48 played an extra pre-playoff round. Playing in groups of three players on three games, only the winner of each group joined the playoffs. Those eight winners from the pre-playoffs joined the 24 players who were directly qualified to play a standard playoff tree. The playoffs were this year played in head-to-head matches, best of three different games. The playoff game bank consisted of: Demolition Man, Judge Dredd, The Addams Family, Fish Tales, World Cup Soccer, Scared Stiff, Medieval Madness and Attack From Mars. Some really good players were knocked out early in the playoffs, surprising many in the audience. Some great battles could be seen. The 2004 champion Jörgen IFK Holm, knocked out the 2003 champion Stellan S B Blomqvist in the quarter finals after a 20B game on Attack From Mars. 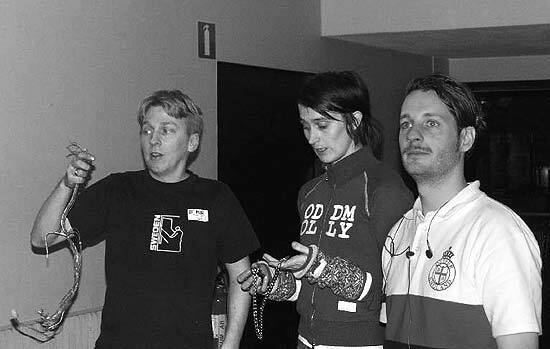 Mats MCR Runsten, the third place winner from last year’s championship, played very solid pinball and knocked out Linus S P Jorenbo, the second place winner of the European Championship 2005, to reach the final. 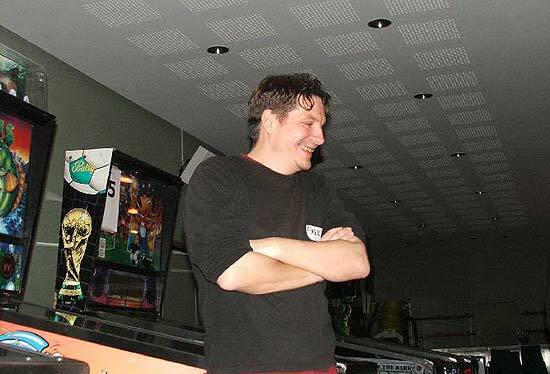 The final was indeed a battle between two of the best pinball players in Sweden: Jörgen IFK Holm vs. Mats MCR Runsten. Quite a crowd was gathered around to watch these two players play for the Championship of 2005. Finalists Jörgen IFK Holm (last year's champion) and Mats MCR Runsten. To the right, Johan GBZ Klint. The first set was played on Medieval Madness and Runsten led comfortably 19M-4M going into the third ball. 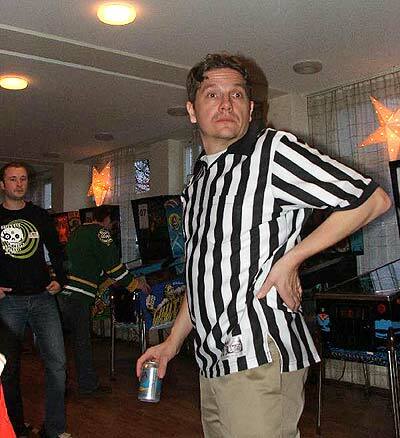 Holm started the regular multiball on his last ball and started scoring jackpots. He managed to nail a couple of super jackpots and played a good Multiball Madness setting the score to 39M-19M. Runsten had quadruple Multiball Madness and Trolls lit in Merlins cup, but struggled to get the ball there. When he finally succeeded it was a mere question of time until he could leave the machine with a score over 43M. The second game was The Addams Family and Holm was forced to win this set or it would all be over. Runsten played a very solid game and during his regular multiball he scored four double jackpots! His score after the third ball was 302M. Holm tried and tried, but his multiballs did not score him enough points to overtake Runsten’s score. The new Swedish Champion is Mats MCR Runsten! Congratulations to Mats who won a nice trophy and a pinball game! Thanks to Peter 'Trazan' Jones who provided the pictures.